The Selene is a Bluetooth speaker that features a "touch" sensitive light. Simply touch the top of the speaker to change the light settings. 4 light modes are available with varying brightness and colors. The Selene will be a great addition to anyone's night stand or office desk. Bluetooth working range is 10 meters (33 feet). Enjoy up to 2hrs. of music at max volume on a single charge. Bluetooth wireless sound system on the go. 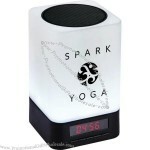 MP3 Speaker with alarm clock radio and docking station.